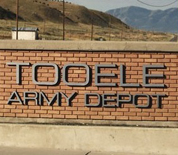 Tooele Army Depot, also referred to as TEAD, is located in Tooele County, Utah. The Depot is a storage site for war reserve and training ammunition with a mission to store, issue, renovate and maintain conventional munitions. The base also serves as a National Inventory Control Point for ammunition. The nearby Deseret Chemical Depot is supported by Tooele. This Tooele Army Depot directory features the critical info you’ll need to navigate through the many facilities and recreational opportunities available on base.